my face isn't cooperating either. i've worn this dress for three days in a row now...it keeps me (somewhat) awake. saturday night i wore it to an alice in wonderland houseparty where i had to crawl through a tiny door to enter and shared knock-knock jokes with a dreadlocked tweedle dum. i can't remember it's origin; i think it's from seattle. 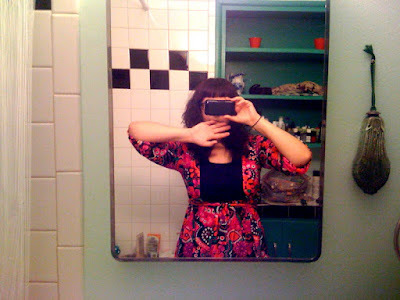 i am single-handedly keeping polyester relevant. (to myself and myself alone). That dress is paisley insanity. i wish i could see your dress in more detail!